This year's WWE Tribute To The Troops opens with a singing of the National Anthem by a staff Sergeant Traci Gregg. The superstars stand side-by-side with the men and women of the U.S. Army. A USA chant breaks out. A promo for Tribute To the Troops plays, honoring the five branches of the United States Armed Forces. It includes clips of past TTTT shows, and loads of photos with your favorite WWE superstars. Michael Cole, Byron Saxton, and JBL welcome us to the 16th annual rendition of this show. Christmas music plays...and The New Day comes out! Big E is dressed as Santa Claus, Kofi Kingston an elf, and Xavier Woods a reindeer! They toss gifts out to the fans. R-Truth and Carmella toss out presents as well. Big E grabs a microphone and says that it's the season to be jolly, and nothing makes the New Day jollier than Tribue to the Troops. Kofi jumps in, and says that the sacrifices made by the U.S. armed forces are very appreciated. Xavier then talks about some of his favorite holiday traditions, like pouring Booty Os in his hot cocoa. Kofi makes a joke about Big E's costume, calling him "Sant E Claus." Segment ends with the New Day staring a "New Day Rocks" chant, but with U-S-A subbed in its place. Michael Cole promises us a fun night of action, including cross-promotion action! AJ Styles and Seth Rollins team up to take on Daniel Bryan and Dean Ambrose. Also announced is a MizTV segment with Charlotte and Becky Lynch. Jon Stewart is also here! Ronda Rousey comes out for the first bout, which is announced as a triple-threat tag, as we go to our first commercial of the evening. The Riott Squad comes out. Liv Morgan and Sarah Logan will be competing. Nia Jax and Tamina are out last and this thing is under way. Rousey and Logan start things off. Tie-up. Rousey shows off her power tossing Logan back with ease. Morgan comes in, but Rousey hip-tosses her. Natalya tags in, double-suplex from Rousey and Natalya. Morgan reverses an Irish-whip, but Natalya nails her with a back-drop. Sharpshooter attempt early, but Morgan escapes and tags in Tamina. Tamina uses her size to take down Natalya. She misses a corner splash, Natalya rolls her up! Two count. Jax blindly tags in...her and Tamina run through Natalya with a shoulder block. Nia works Natalya down with a big running elbow drop. Tamina comes back in and targets Natalya's body. Natalya cradles Tamina, but Tamina escapes with ease. Corner splash from Tamina. Second one misses, and Sarah Logan tags back in. Logan taunts Rousey before locking in a cobra-clutch on Natalya. Natalya breaks the hold but Logan cuts her off with a running dropkick. Pinfall attempt...Natalya escapes. She finally breaks off...Rousey's in! Rousey runs over Logan with lariats, judo-throws, and right hands. Tamina runs in but Rousey takes care of her. Natalya decapitates Tamina with a discus clothesline. Riott Squad goes after Rousey, but Rousey grabs them both and tosses them over. She sets up for a double-armbar...and locks it in! They both tap! JBL says he's never seen anything like that double-submission before. Rousey gets on the microphone and says what an incredible honor it is to perform in front of the troops. She calls them all the true champions, and from the bottom of her heart, thanks them for all of their sacrifices. Coming up after this next commercial...Jon Stewart! Video package of Jon Stewart spending time with the troops, meeting with them one-on-one, and talking about how fantastic it is to spend time with all the wonderful men and women who serve their country. Following Wallen, Elias comes out from their entrance path. He plays a little diddy, and then asks the Troops..."WHO WANTS TO WALK WITH ELIAS?" Back from break and Finn Balor is on his way to the ring. Cole puts over how much he enjoys Balor and Elias teaming together. Lio Rush is out next to introduce Bobby Lashley. The big Scotsman Drew McIntyre is out last. Elias and Lashley start things off. Lashley cheap shots Balor off the apron and then charges Elias into his teams corner. Drew comes in and starts chopping away at Elias' chest. He and Lashley tag in and out to wear Elias down. Double team attempt, but Elias dodges it and tags in Balor. Balor comes in hot nailing Drew with two flying forearms. McIntyre picks him up for a powerbomb attempt but Balor shifts his weight and lands on his feet. He attacks Lashley on the apron, but Drew nails him from behind. Lashley and Drew in control as we go to another commercial. Drew with a big suplex on Balor. Lashley tags in and rams Balor in the gut with a big right hand. Rear chin-lock from Lashley, but Balor gets to his feet and nearly tags Elias in! Lashely thwarts his attempt and whips him into the turnbuckle. Balor fights out of the corner, but Lashley grabs him and rams him into the turnbuckle again. Lashley misses a splash and Balor's about to tag in Elias but Drew pulls Elias' leg out! Lashley then throws Balor into Drew who destroys Balor with a tilt-a-whirl backbreaker. Cover, but Balor kicks out. Drew taunts Balor, asking "is that all you got?" Balor bounces off the ropes and lands a spiraling tornado DDT! Both men are down! They both tag out! Elias comes in with fire. Running through Lashley with lariats, shoulder bumps, and a jumping knee. Elias attacks Drew, then climbs to the top. Lio Rush jumps on the apron to stop Elias' attack. He chases him, but runs right into Lashley who hits a spinebuster. Balor breaks up the pin with the Coup De Grace! Drew goes after Balor...he throws Drew out. TOPE CON HILO! Back in the ring Elias rolls up Lashley, but Lio Rush holds Lashley's hand! Balor attacks Rush and Lashley gets pinned! Commentary hypes up the cross-brand tag match, but coming up next is MizTV with Charlotte and Becky! Video package. 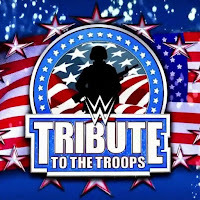 A slew of WWE superstars, including Sasha Banks, Bayley, and Bobby Lashley, thank the Troops and the WWE Universe for their constant support. They all wish us a happy holidays. Miz is already in the ring after the video segment. Troops are chanting "Miz is awesome!" He introduces his co-star for the Marine 6, Becky Lynch. Miz thanks Becky for being here, but reminds her that she's not his only guest. The Queen comes out. Recap of the events of the TLC main event. If you missed it, Ronda Rousey knocked over the ladder with Charlotte and Becky on it, leading Asuka to become the SmackDown women's champion. Charlotte and Becky stare each other down. Miz pushes them apart and asks them to take their seats. His first question is to Charlotte: He wants to know about the friendship between Becky and Charlotte, and says that it'll never compare to his friendship with Shane McMahon. Miz also says that Charlotte never had to stand in anyone's shadow as long as Becky had to stand in hers. Charlotte says that Queens don't stand in shadows. "WOOO!" Miz uses that momentum to apologize to Becky for overshadowing her in their movie together. Becky responds by saying "that's might big of you Miz. I guess that's the only time that's ever been said of you." Becky says Miz is pretending to be something he is not, while Becky continues to be what she always is..."The Man." This brings out Mandy Rose and Sonya Deville. Mandy says that she's sick of the SmackDown women's division only revolving around Charlotte and Becky. Sonya jumps in and states that Mandy has way more class than Charlotte, and taunts Becky, telling her that she hits a lot harder than Nia Jax. Mandy initiates a challenge, and Charlotte accepts on her and Becky's behalf. Match is made official as we go to break. Charlotte and Sonya begin. Sonya wins the first exchange with an arm-drag. Charlotte shows off some athleticism and tosses Sonya to the outside. Mandy comes in and she tosses her out as well. She goes to tag in Becky...but then WOOS instead. Charlotte planchas to the outside right onto Sonya and Mandy! Back in the ring Sonya and Charlotte exchange waist-locks. Charlotte with the roll-up but Sonya tagged in Mandy. Mandy comes in and surprises Charlotte with a running knee to the face. Quick tags in and out from Mandy and Sonya. Sonya wears Charlotte down with a body-scissor. Charlotte escapes but Sonya irish-whips her into the turnbuckle, sending Charlotte over the top...no wait...she lands on the apron! (Classic Flair.) She kicks Mandy but Sonya lands a strike and the heels still have control. Charlotte attempts a comeback by slamming Mandy, but Mandy slips away and pushes Charlotte into the middle turnbuckle. Double-team attempt but Charlotte fights off both women. Sonya gets the better of her, but then taunts Becky. Charlotte with the roll-up! Sonya kicks out, but Charlotte goes for the tag...Mandy with the distraction...tag is made but the ref doesn't see it! Becky and the ref argue but it doesn't help. Mandy and Sonya work Charlotte over. They throw Charlotte in the corner....Becky tags in. Charlotte still attacks Sonya, but Becky comes in and picks up the pieces. DISARMER! SONYA TAPS! Becky leaves immediately, leaving Charlotte to celebrate by herself. The Man doesn't even look back. Special guest Jon Stewart will be out live next after the break. Stewart comes out, giving out high-fives and getting a good reaction from the troops. He gets on the microphone and talks about how honored he is to be there, before poking fun at the weather for being so cold. (Event is in Texas.) He says that his parents were stationed at a Fort Bliss (name of the venue), and jokes that any Fort called Bliss is obviously a sh*thole. (Troops laugh.) He does some material about how Jews age like avocados. Stewart then says that he recently flew to Afghanistan in a C-17. He says that traveling on a C-17 is great if you're a tank. Stewart tells a story about experiencing a combat landing, and how he threw up all over the place. His sets ends by calling his time there a privilege, and thanks them all for their service. Another video package of WWE superstars spending time with the troops. This one includes a slew of photos with the likes of Booker T, Alexa Bliss, Braun Strowman, Paige, Triple-H, Baron Corbin, and even Ric Flair! WWE roster visiting injured soldiers. The Major that puts the event together talks about how the WWE is a great morale booster for the men and women. Commentary hypes the cross-promotion main event once again as they go to commercial. Morgan Wallen is back with another live performance, this time with his #1 hit "Up Down." Following the concert, Dean Ambrose's music hits, which means it's main event time! The Phenomenal One is out next, followed by the former Intercontinental champion, Seth Rollins. Bryan and Dean blindslide the faces while they enter the ring. Seth throws Dean outside. Styles takes out Bryan with a sliding knee! They stand tall. Dean and Seth start out. Seth unloads on Dean with chops, and a superkick to the gut. Slingblade. Seth sets Dean up for the Stomp but Bryan trips him up, giving Dean the opportunity to take Seth out. Final commercial of the night. Back from break and Dean is still working over Seth. He has an armbar locked in, but Seth breaks the hold. Dean fires right back with a huge lariat taking Seth down. He goes for a superplex but Seth blocks it, headbutting Dean and setting him up for a powerbomb. He sunset flips and lands the buckle bomb! Both men are down. They both slowly crawl to their respective corners...STYLES AND BRYAN ARE IN. They trade blows in the center. Bryan backflips over Styles, but Styles evades and lands a dropkick. (FLUSH.) He picks Bryan up...Ushigoroshi. He goes for the Styles Clash, but Bryan responds with an enziguri. He goes for his signature corner dropkick, but Styles transitions into the calf-crusher! Dean breaks the hold. Seth flys in to take out Dean, but Bryan blindslides Seth. Dean goes for the Dirty Deeds, but Seth blocks it. Bryan goes to hit Seth but Seth moves and he nails Dean, who goes to the outside. Seth with a suicide dive! Back in the ring Styles hits the phenomenal forearm on Bryan. Got em! Post-match, Rollins and Styles cut a promo to the troops. Rollins calls himself and AJ two of the hardest fighters within the WWE, but it doesn't compare to the fight inside the men and women of armed services. Styles gets on the microphone and says he came from a military family. He thanks them all. Commentary team signs off, calling Tribute to the Troops their favorite event of the year. The entirety of the WWE roster come out to high-five, and give thanks to the troops individually. Cole wishes us all a happy holidays.